Caution - Support the CMA during this installation. 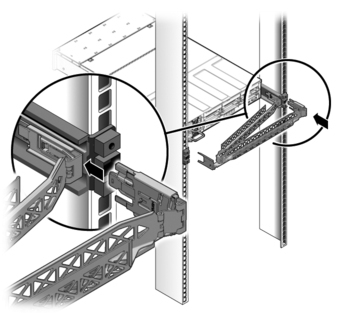 Do not allow the assembly to hang by its own weight until it is secured by all three attachment points. Remove the tape from the CMA rail extension (on the left of the CMA) and remove the CMA rail extension. Attach the CMA rail extension to rear left slide rail. 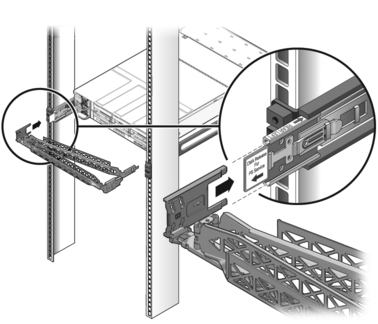 At the rear of the rack, plug the CMA rail extension into the end of the left sliding rail assembly. The tab at the front of the rail extension clicks into place. The right sides of the two CMA arms have hinged extensions. On the manufacturer’s instruction sheet, the smaller extension is called the CMA Connector for Inner Member. This extension attaches to the right mounting bracket. 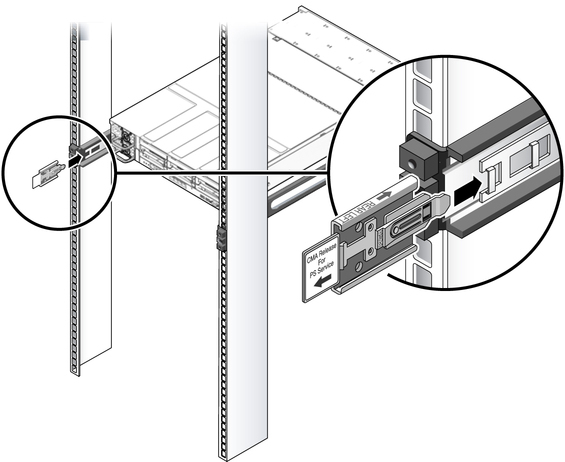 The larger extension is called the CMA Connector for Outer Member, and attaches to the right sliding rail. Insert the smaller extension into the clip located at the end of the mounting bracket. Slide the smaller extension into the square hole on the middle-in-width of the clip that is located at the end of the mounting bracket. 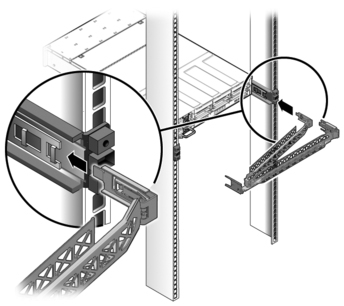 Insert the larger extension into the end of the right sliding rail. Insert the hinged plastic connector at the left side of the CMA fully into the CMA rail extension. The plastic tab on the CMA rail extension locks the hinged plastic connector in place.